The book module enables a teacher to create a multi-page resource in a book-like format, with chapters and subchapters. Books can contain media files as well as text and are useful for displaying lengthy passages of information which can be broken down into sections. A book may be used to display reading material for individual modules of study, a staff departmental handbook, or a showcase portfolio of student work. 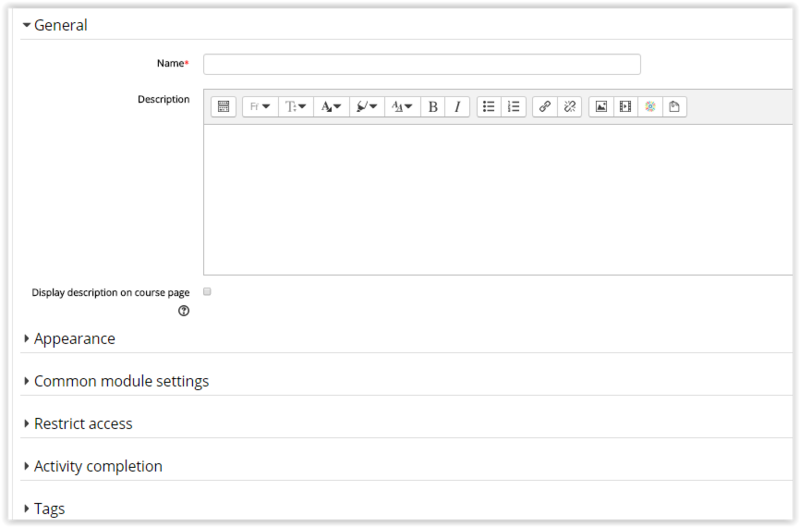 It is a way to display HTML content seamlessly in Moodle. To edit an existing Book, please see Moodle 3: Activities & Resources: Edit or Add Chapters to a Book. 3. Click Add an activity or resource. Please Note: There are two different ways to complete the next step depending on which view you are in. If you see two separate drop-down boxes, click Add a resource and select Book. For more information about this option, view Activity Chooser Options. 4. 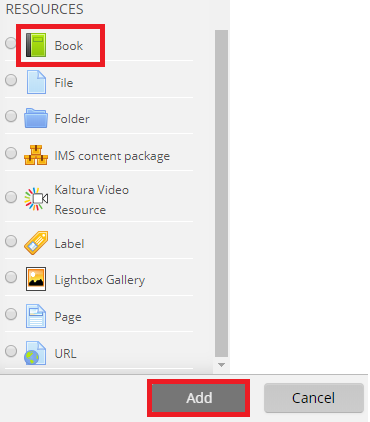 Select Book & click Add. 5. Assign a Name and description (optional) to the book. 6. Personalize the book in the Book Settings. 7. Click Save and display when you are finished. This will send you to a page where you can edit the chapter and sub-chapter titles. 8. Click Save Changes once you have added those.